Many of Manny Trembley's stories were inspired by deeply personal moments in his family's life. Manny Trembley's alternate universe is vivid, colorful and happy. A little girl lives there with her cadre of monster friends: vampires, zombies, unicorns, werewolves; an endless menagerie of otherworldly creatures. It's a place filled with love, loyalty and learning. The importance of family and an unprejudiced acceptance of others are the law of the land. Amidst all the warm fuzzies and encouraging ideals in this magical world, its characters — and its creator — also face pain and grief. They sometimes stumble as they learn to forgive and move forward. 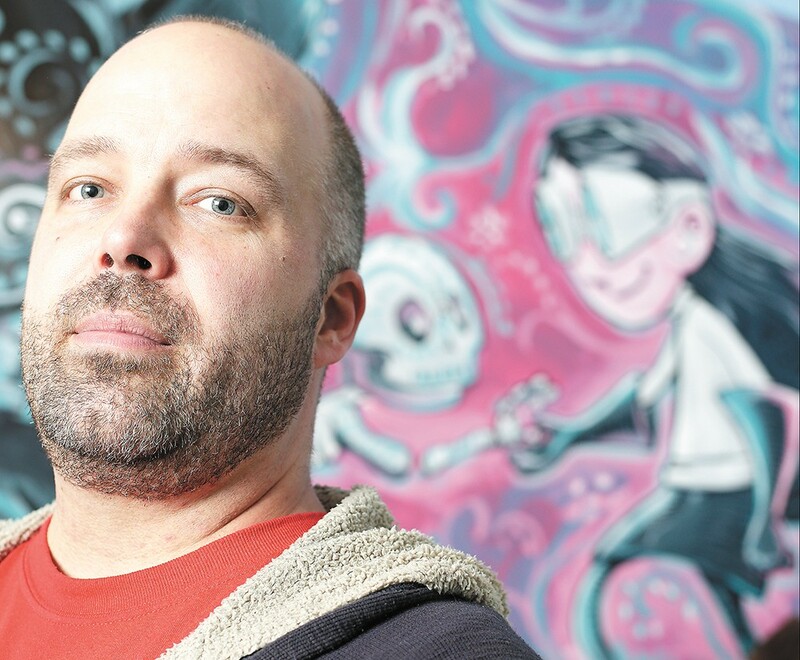 Since moving to Spokane more than a decade ago, Trembley has established a healthy fan base, both locally and beyond, for his fantasy art and stories that span a range of styles and genres. He's currently working full-time as a graphic artist, novelist and game designer. Like many creative types, he says he makes his art for himself. "There is not a single book I made with someone else in mind," Trembley explains. "When I make a book, I try hard to find something to express and explore, and then share. That small part of me that I share with people expresses a little of who I am in each book, and I like that." Trembley's current ongoing series, Victoria Jr., originated a few years ago when he and his wife Lisa were exploring the possibility of adopting a little girl. In RGB, a separate book published before that, Trembley processes the grief that he and Lisa experienced after two miscarriages. The couple still might adopt someday, and are now raising two young sons of their own. Beyond these deeply personal connections, Victoria's adventures in her fantastical, monster-filled world present themes anyone can appreciate. Trembley has self-published four Victoria books since last year through his own FishTank Books. The series' next installment, Victoria Jr. and the Under Wunderland, was successfully funded on Kickstarter this month, with more than $12,600 pledged. This new story was inspired by Trembley's son's profound sadness after the death of his betta fish, Mr. Love. "He kept telling me 'I wish I could watch him one more time,'" the artist says. "So I thought it would be interesting to write a book about loss... It's by no means a manifesto on the afterlife, it's more a statement on wishing we had one more day, but we do — we have one more day right now." The only human living in a world filled with monsters, Victoria was adopted by her monster parents, inspired by Victor Frankenstein's stitched-up creations. Victoria — whose signature getup is a pair of goggles and elbow-length laboratory gloves — is independent, smart, thoughtful and kind; a female characterization that's typically rare in the graphic novel/comic-book world. Trembley says creating a feminist's dream character was an unintended consequence he realized in hindsight. "I have always loved monsters and Frankenstein, and the tragic nature of who the monster is," he explains. "We live in a pretty crappy world sometimes, and having some positive influence of a little girl who lives in a world full of monsters — she's not oblivious of the problems, but she is willing to be friends." 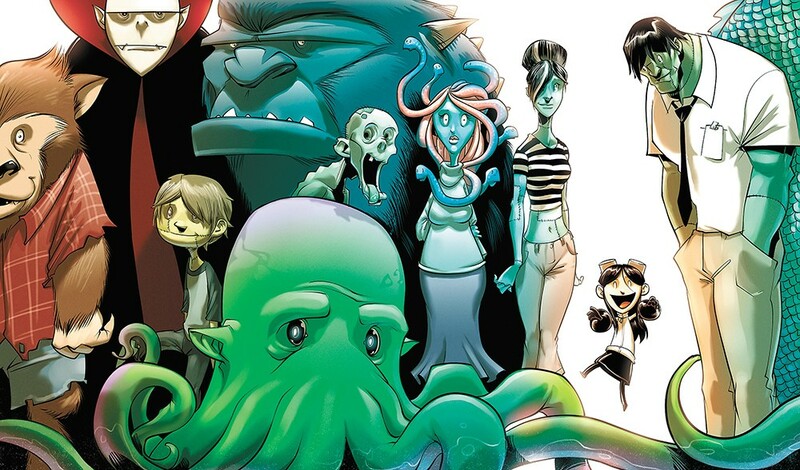 Art from the cover of Trembley's first book in the Victoria Jr. series. Throughout his artistic career, Trembley has illustrated and written many other graphic novels and comic books for a variety of audiences. Though one of his current focuses is creating all-ages material that he envisions his sons — ages 4 and 6 — soon enjoying, Trembley also co-wrote (with Spokane's Eric A. Anderson) and illustrated the Sam Noir comic miniseries, first published 10 years ago. The duo had also previously teamed up for the all-ages series Panda Xpress, which was nominated for two Eisner Awards, comic books' version of the Oscars. Trembley and his wife found themselves headed to Spokane from the Midwest 12 years ago after he accepted a job as a game designer and concept artist for locally based Cyan Inc., makers of the classic game Myst and the new Obduction. Today, after being hired and laid off from several graphic design gigs, Trembley is able to focus all his time on writing and publishing his original series, as well as co-designing (with Nate Chatellier) a board game that will soon go to Kickstarter. Dice Throne is a multiplayer, tactical dice-rolling game for which players pick from a classic fantasy character class (elf, paladin, pyromancer, barbarian) and roll a set of five dice each turn to choose their characters' moves. While the Kickstarter frenzy has calmed since the crowdfunding platform first took off, publishers and content creators like Trembley are finding continued success using it as a marketing tool to essentially pre-sell product while also interacting with fans. "It's an absolute game changer for independent publishers — there is no comparison," Trembley says. "What crowdfunding has done is allowed me as a creator to completely ignore the publishers. Not as in turn my nose up, but I don't have to go through a publisher anymore. And the fans get to feel like they're owning the game in a personal sense." In the final pages of two Victoria Jr. books, Trembley includes several fan-written stories he illustrated. Fan art from kids, along with a list of all his Kickstarter backers, is also included in both volumes. Find Manny Trembley's work and follow his projects at facebook.com/MannyTrembleyArt and at fishtankbooks.com.